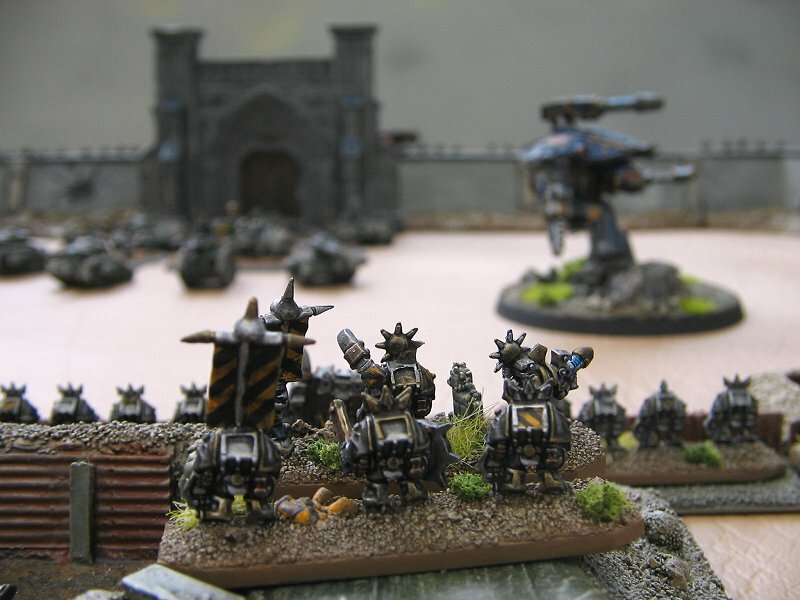 40K (Heresy era) 30K Iron Warriors. 40K (Heresy era) Iron Hands. 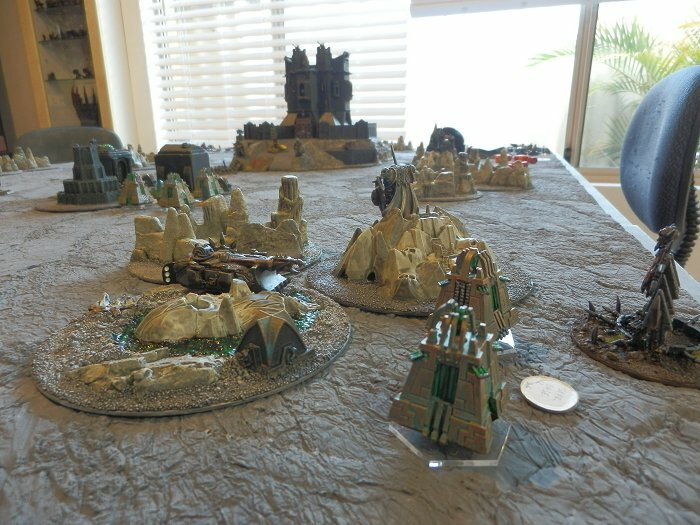 VARIOUS TERRAIN PIECES AND DIORAMAS. 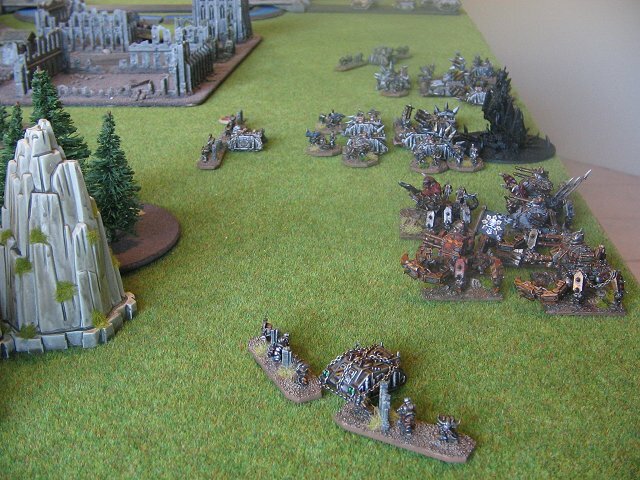 LORD OF THE RINGS Strategy Battle Game. My Lord of the Rings armies. A Fortress of Gondor, Dol Amroth… & Mordor. 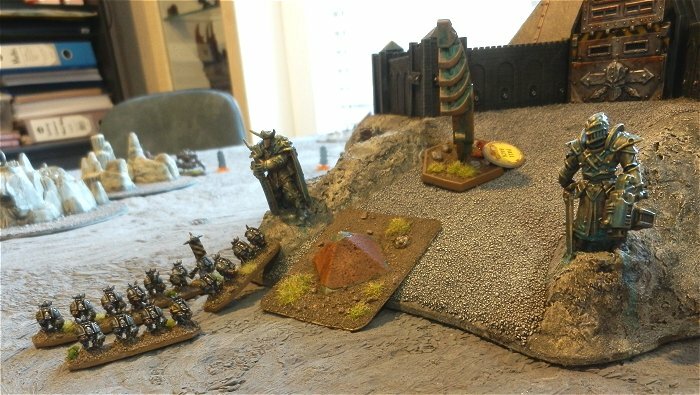 Terrain for the Unsung Heroes Tournament. 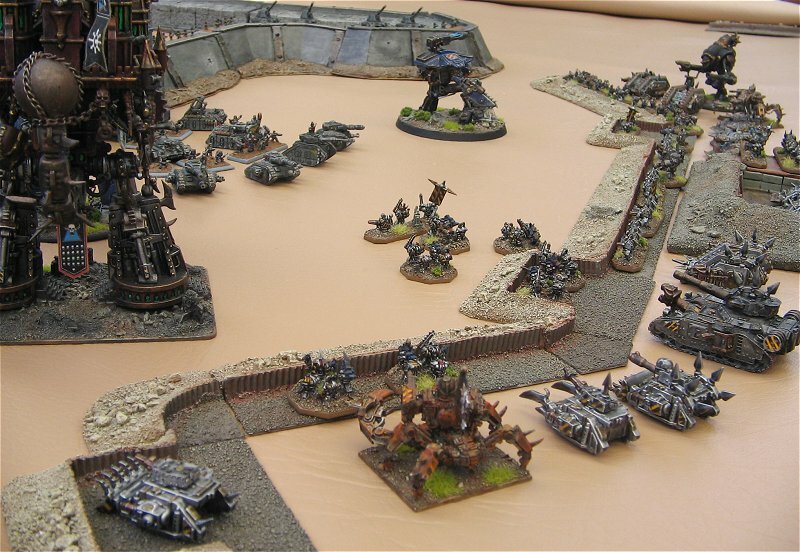 There is Only War 2010 – An Epic Armageddon Tournament. 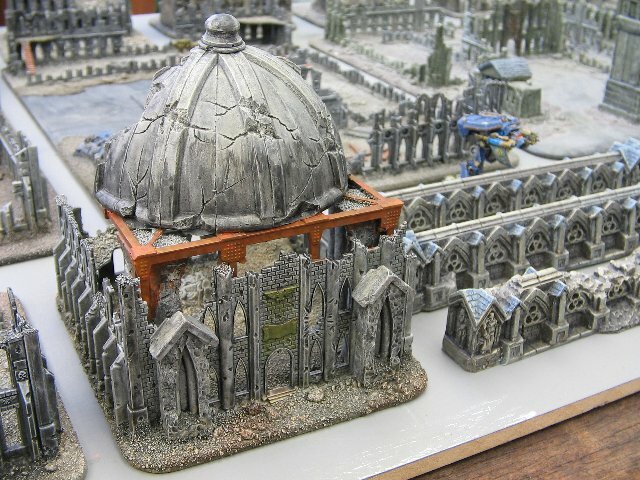 There is Only War 2014 – An Epic Armageddon tournament. 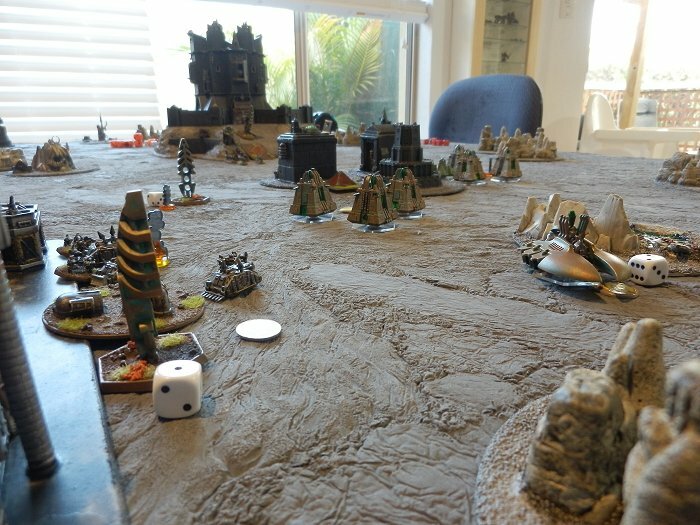 Here’s where I’ll show some of the battlefields that my Epic armies fight on. 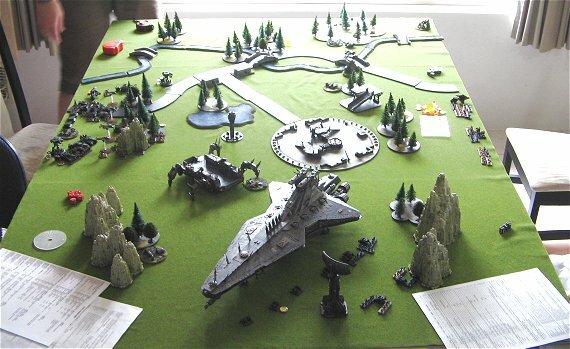 I’ve always felt that great looking terrain helps players get into a game. 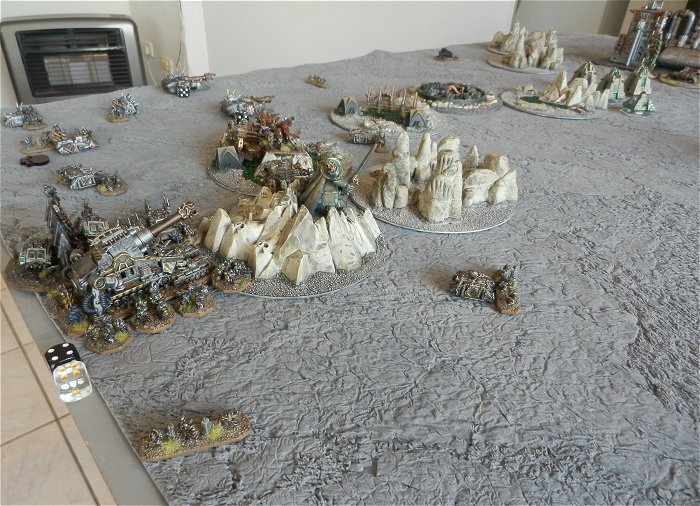 With my LotR terrain I constructed many purpose built boards which look good but take up a lot of storage space and are more easily damaged. With my Epic terrain, I decided early on to make my collection much easier to store whilst trying to keep the detail high. To this end, I’ve created/bought many smaller pieces that can be set up in different positions every game. It doesn’t look quite as good as the LotR stuff but is a lot more practical. 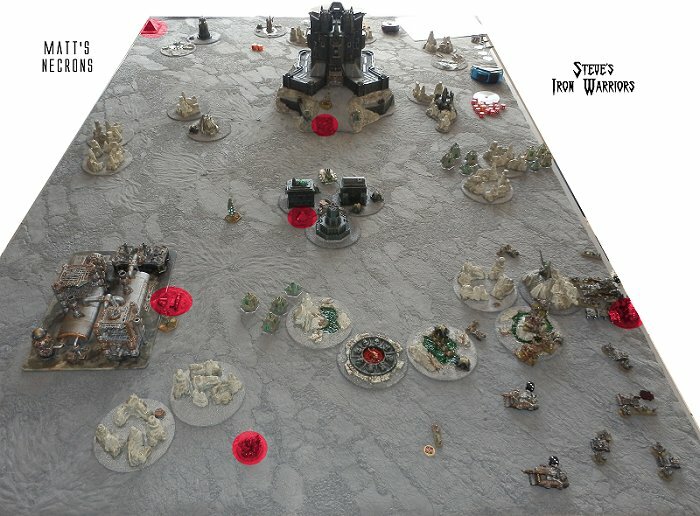 4th May 2014 – Here’s the start of another themed table. 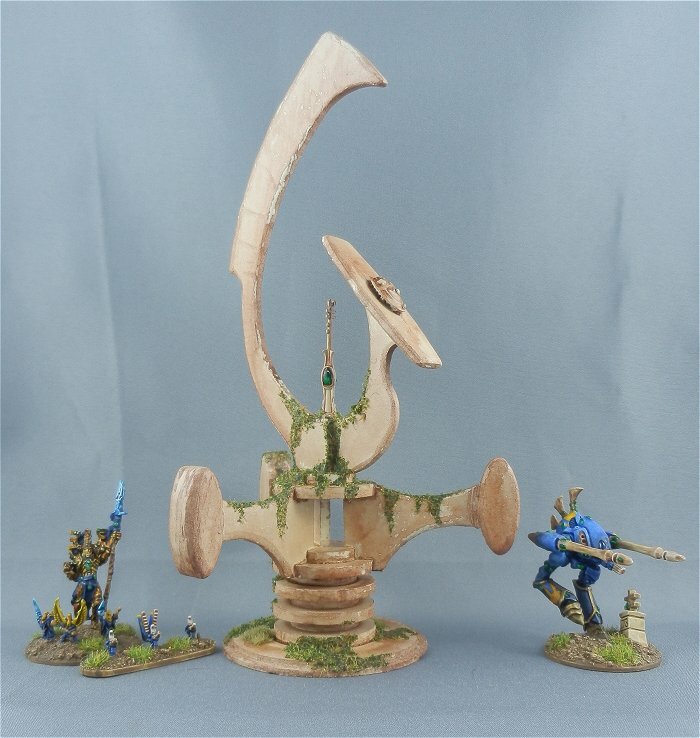 This time it’s going to be an old, overgrown Eldar outpost. 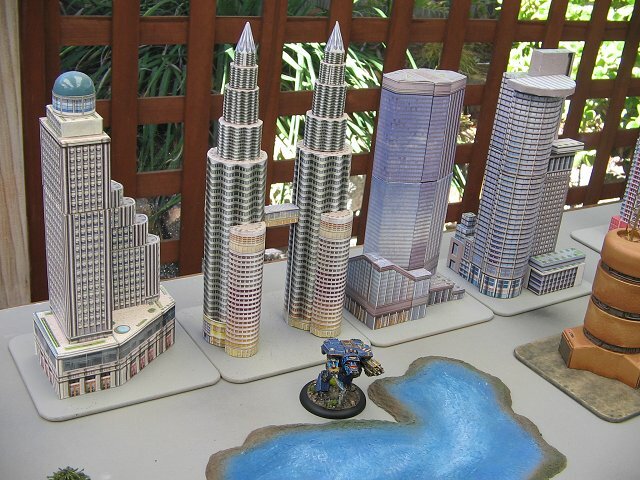 The buildings are from CNC Workshop in Australia. 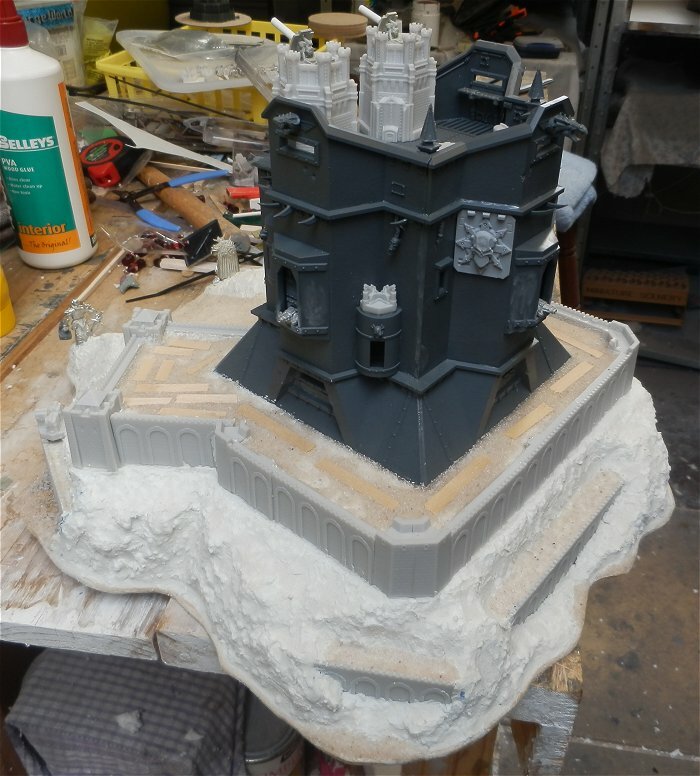 7th June 2012 – Here are a few work in progress of my newest Epic terrain – A fortress for my Iron Warriors (along with scenery to depict Madregard, the Iron Warriors home world). 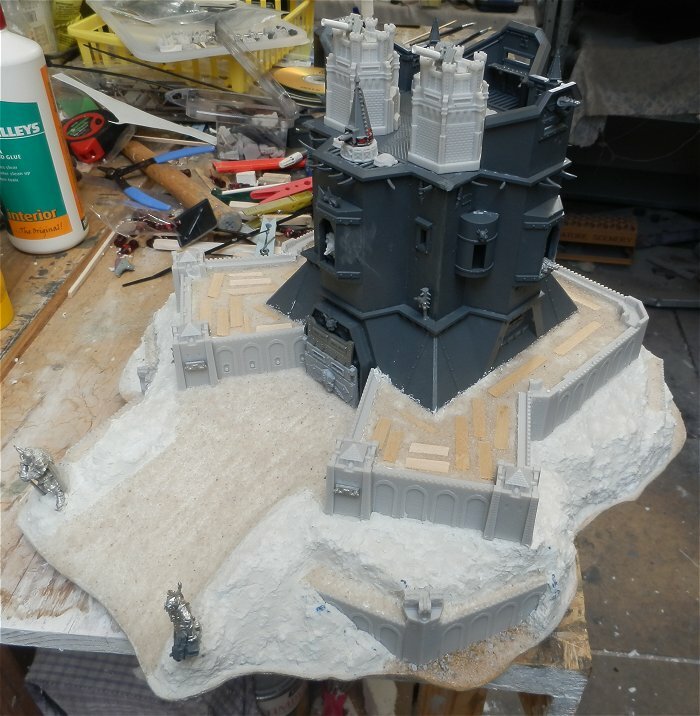 The fortress was made using a Games Workshop bastion kit (and othe GW bspare parts I had), Spartan Games bits, Forgeworld bits, Exodus Wars bits, polystyrene and MDF. Next up, my Adeptus Mechanicus Manufactorum. This is basically a factory that builds Titans (30 meter tall war machines) – hence the large doors. 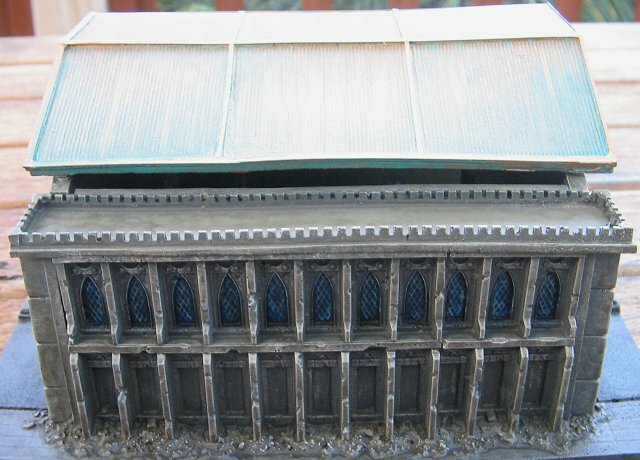 I based this piece on a Pegasus Hobbies Gothic City Small Building Set 2. The roof is hardened polystyrene whilst the base is 3mm MDF (to fit in with the CNC City Block tiles I also use). 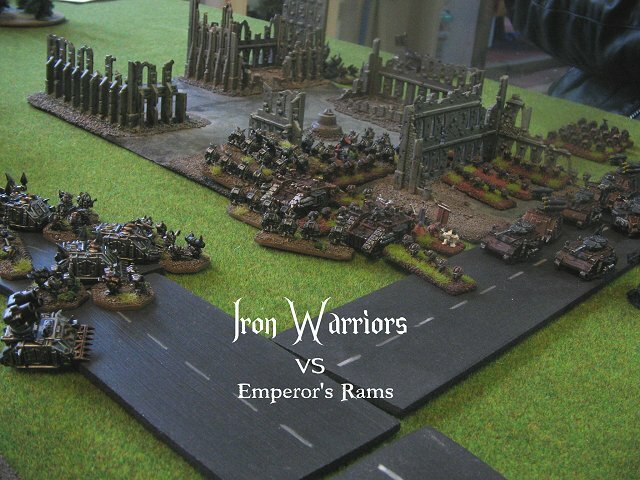 The pipes are from a Conflix Chemical Plant set whilst the AA guns & Ad Mech skull symbol are from Forge World. 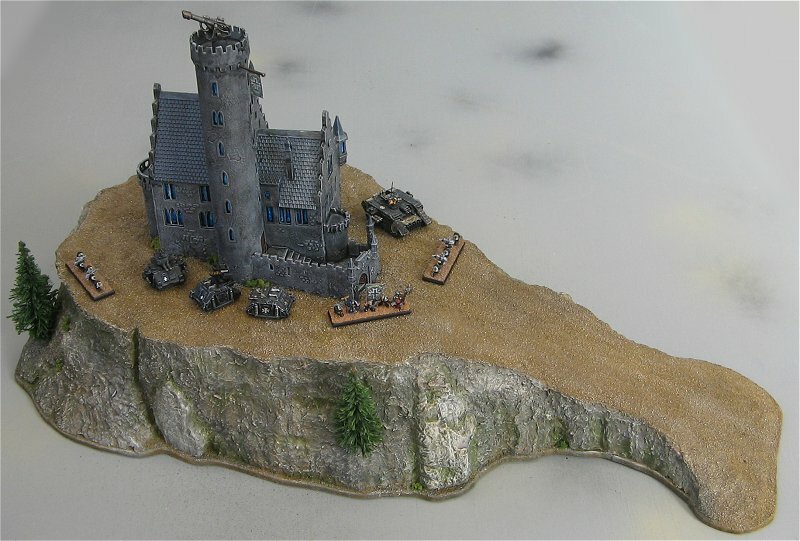 The castle is an ‘N’ gauge model railway kit that I’ve had for years. I built the hill out of hardened polystyrene. 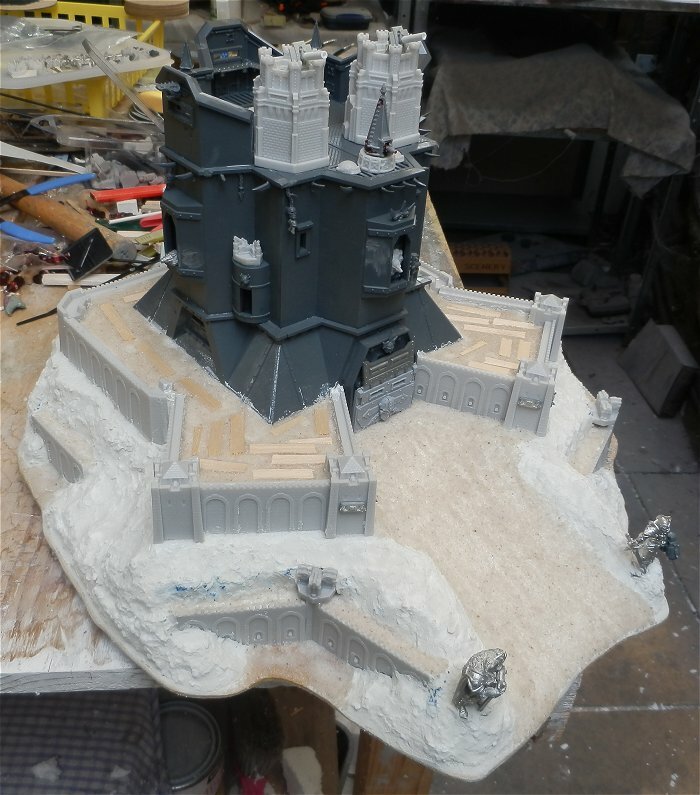 Once I’d carved the cliffs I used polyfilla to give a more rocky look. I also used a couple of Woodland Scenics rock moulds for a bit of variety on the cliffs. Sadly this doesn’t actually belong to me. I was lent to me by it’s owner so we could use it in our campaigns and tournaments. I painted it for the owner as payment for borrowing it. 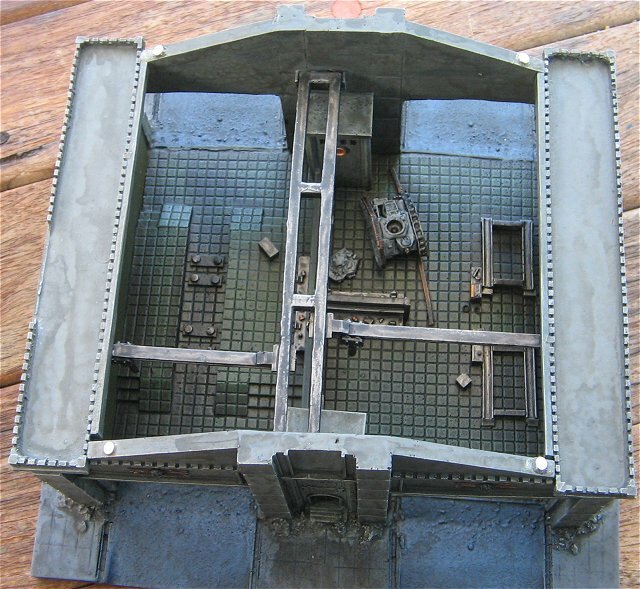 I made these pieces from a Conflix Chemical Plant kit, ‘N’ guage railway buildings and 1/300 scale buildings from JR Miniatures. The ladders & stairways were made using cable ties (the idea was given to me by a Mark_Logue). 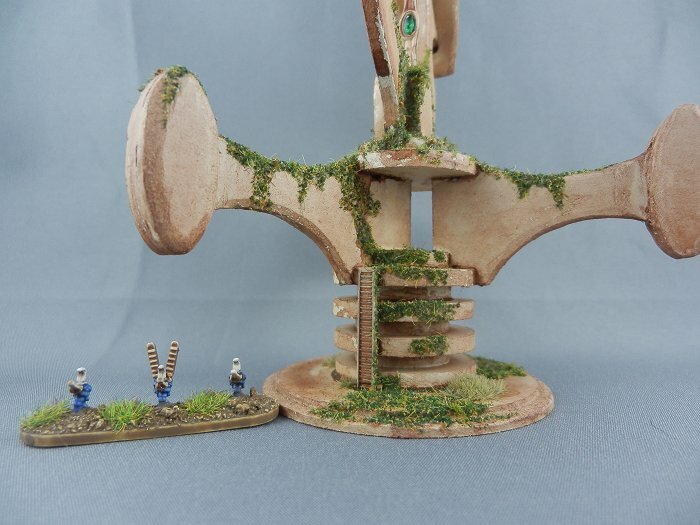 They are based on 3mm MDF and are generally painted using Woodland Scenics pigments (for the rust and dirty/oily look) and acrylic paint for the ground. These silicone river sections are from JR Miniatures. 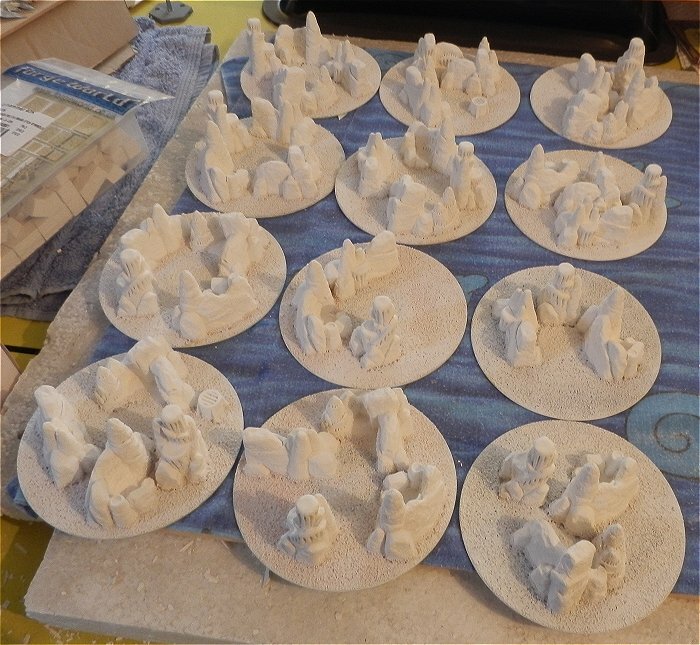 The mountain pieces are terrain from a game called Heroscape. 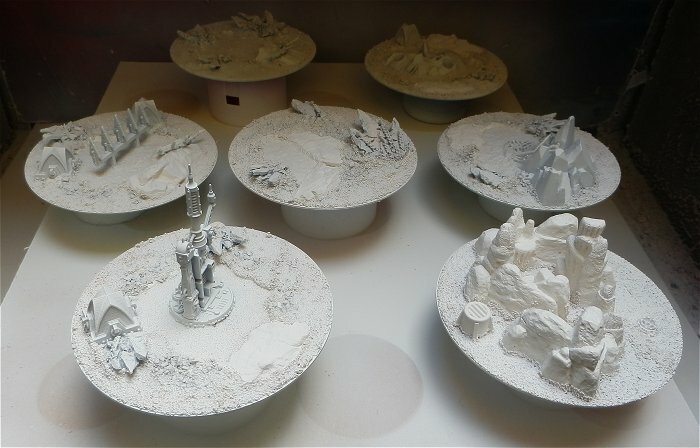 I repainted them (they are coloured to repesent ice peaks originally) and added some vegetation. 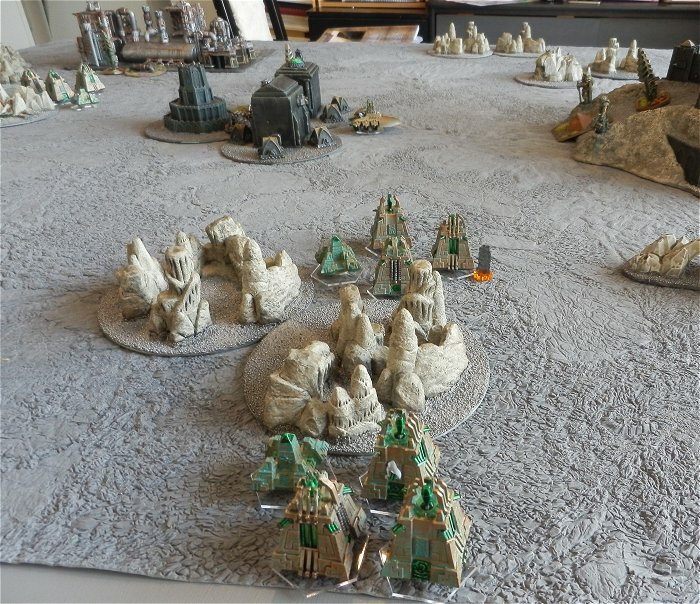 These terrain elements are very customisable and get used in just about every game we play. The bridges are from JR Miniatures. These ruined building sections are mainly Games Workshop plastic pieces glued onto MDF bases. 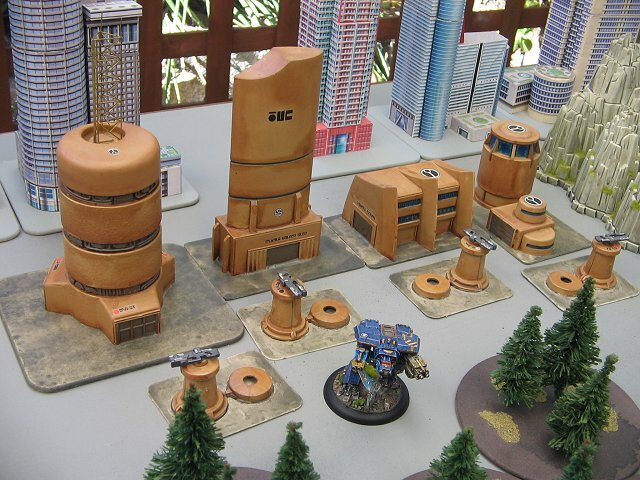 I’ve Also used the (out of production) polystyrene buildings to give some variety to my bombed out cities. I carved the backs out of them and generally made them look like they are about to fall down. 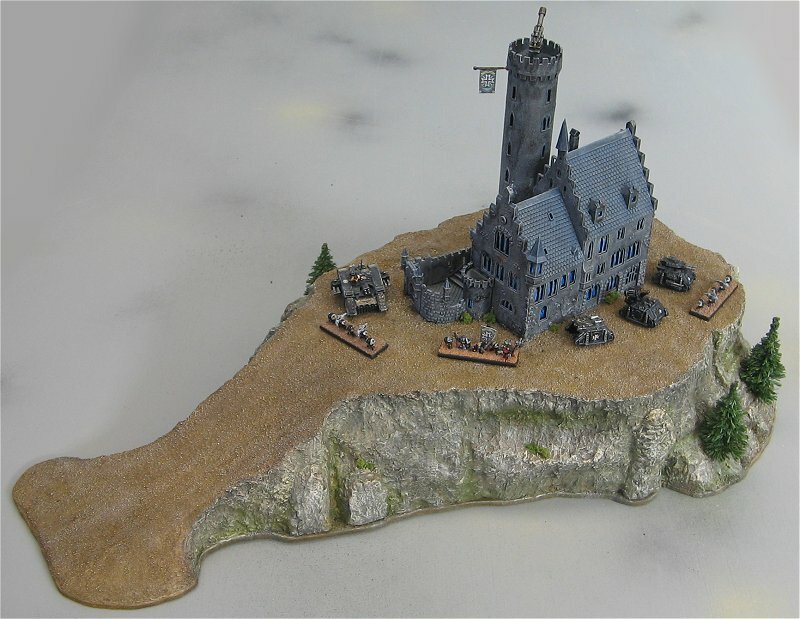 There is also an archway and small courthouse from JR Miniatures. This piece was made using an MDF base. 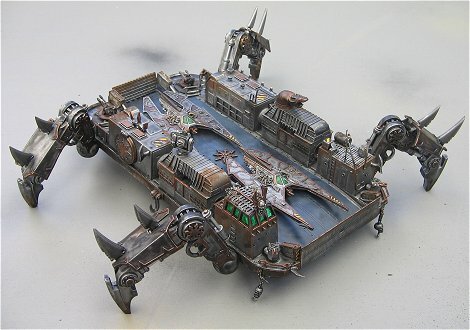 The landing pads and buildings are from Dark Realm Miniatures. The concrete barriers are made with Hirst Arts blocks. The boom gates are from an ‘N’ guage train crossover set. 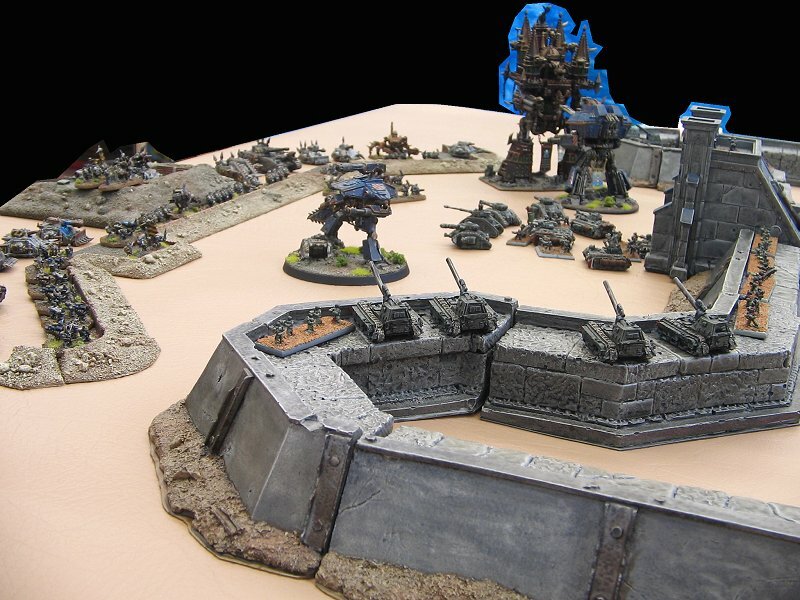 The guard bunker is a Games Workshop objective. 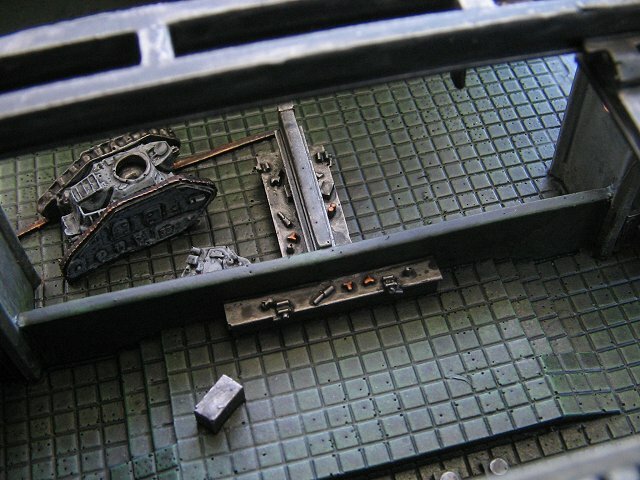 The barbed wire is just coiled fuse wire and the tank traps are leftover bits of sprue. 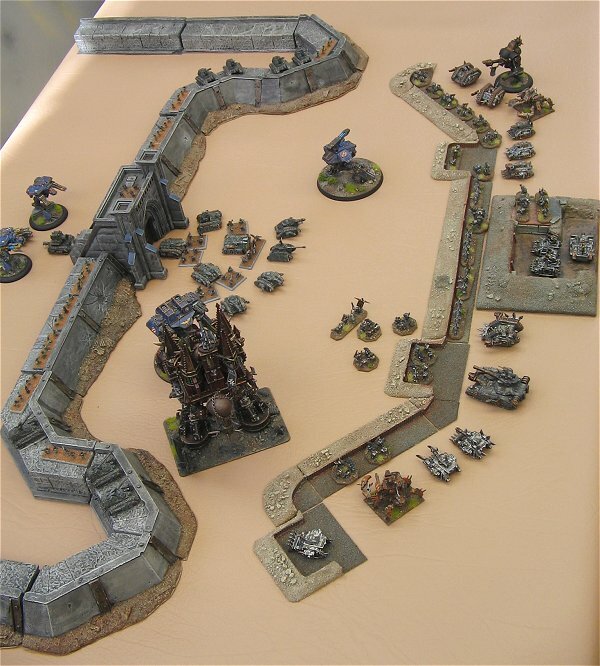 The fortress wall were converted out of Forge World 40K Firing Line set. 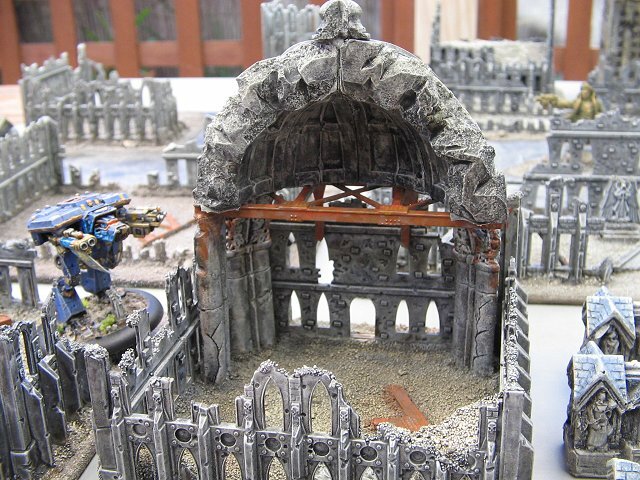 The gate is a Forge World 40K Undergound Bunker entrance. 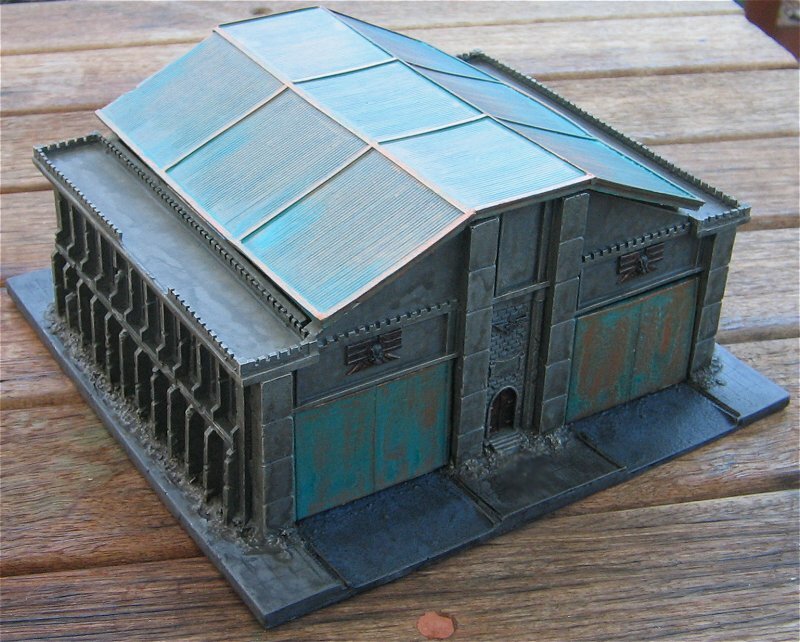 These buildings are from Old Crow Models. As soon as I saw them I thought of Tau. The larger Tau buildings below are actually magnetic wooden puzzles from IDA 3D (not sure if these things are still available). I was very fortunate to find a local supplier of these buildings. They are from a company called IDA3D. They are actually wooden puzzle block pieces that have magnets in the base. I originally discovered them on the internet a few years ago but was unable to get the seller to deal fairly with international postage. Later I accidently found them through a local wholesaler and love the gothic look to them. I bought about 20 different buildings to be able to reconstruct an Imperial administrative area or a Governor’s mansion. 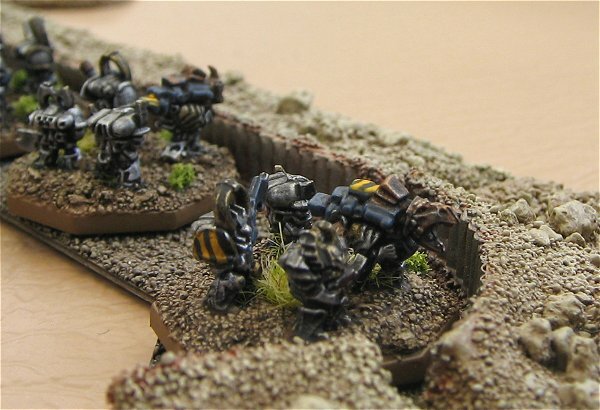 I really liked the imagery of the Iron Warriors as the land on Hydra Cordatus in Storm of Iron. I wanted to find someway to recreate that look for my Epic Armageddon battles. 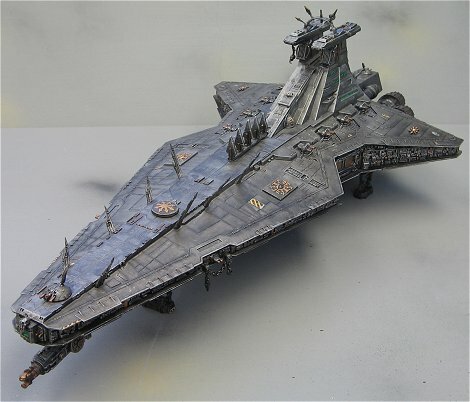 I’ve used a STar Wars Venator class Star Destroyer as a base for my Armoured Dropship and a 1/144 Japanese military hovercraft as the base for my Land Transport. 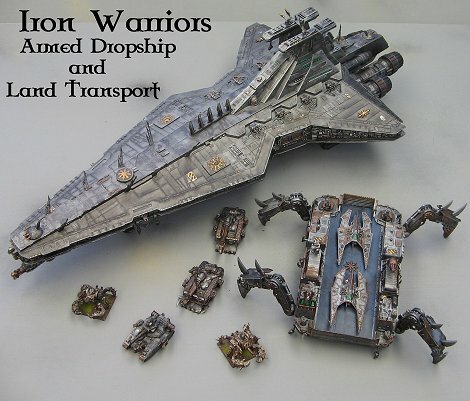 The Dropship was chaosified with some spikes, guns, demon heads, etc. from my spares box. 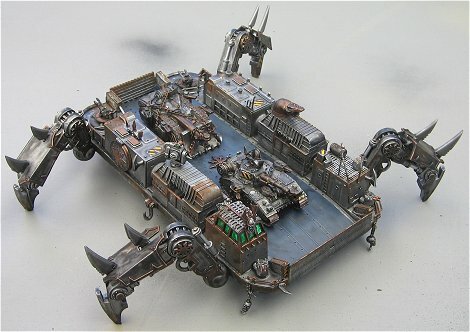 The Land Transport was chaosified using 40K Defiler legs, spikes, Forgeworld AA guns, various plastic chains etc. I made these pieces from scratch. They are based on plasticard. The corrigated walls are made using card (which I pinched from my wife’ card making craft box). The piled up dirt is Polyfila. I used a few different types of talus/sand to give texture. The following are some of the different objectives I’ve made. These pieces represent important areas of the battlefield which must be claimed in order to win the game. 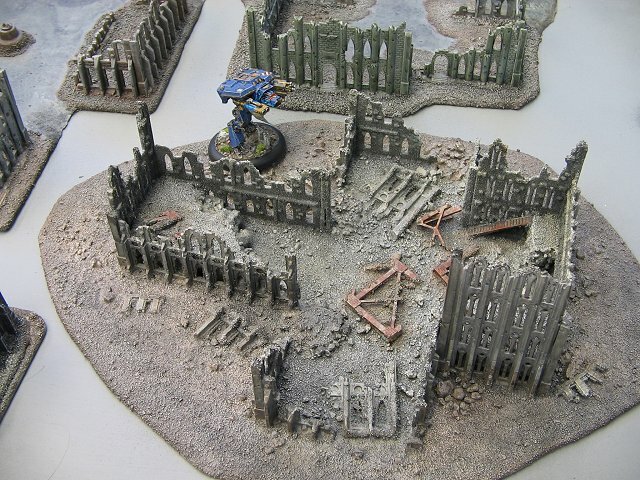 A Black Templar ruined monastery. 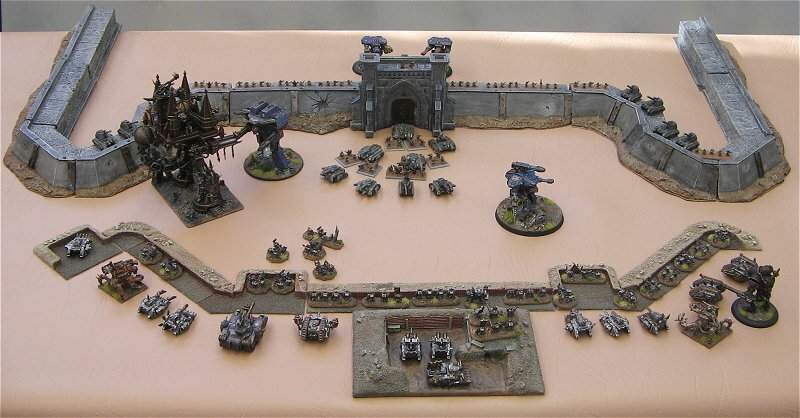 An Imperial Guard command base. 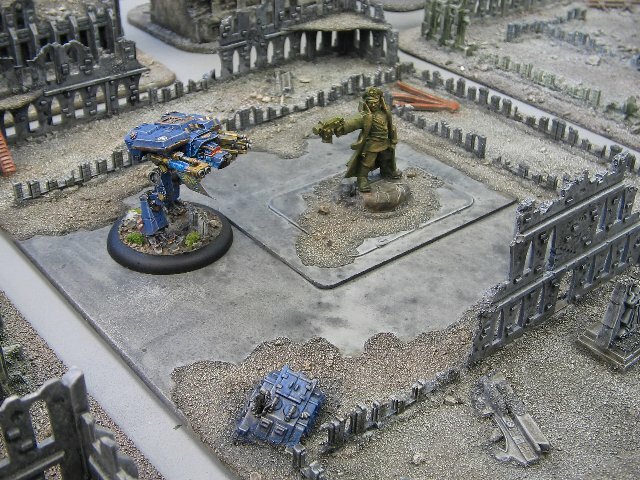 A crash-landed Tau Barracuda fighter. Here are photos from some of the games we’ve played. They’ll be more photos soon. Tactical Command (best Epic Forum around).